Let me start off by clearly stating, I’m not a car mom. I have one that safely takes us from Point A to Point B but know very little about it. Perhaps that’s why I was so intrigued by the Detroit Auto Show on until January 22, 2017 at the Cobo Center in Detroit, Michigan. What I learned at the show is that the future of family cars that I imagined to be still lightyears away is here and it’s sitting on the Hyundai show floor. 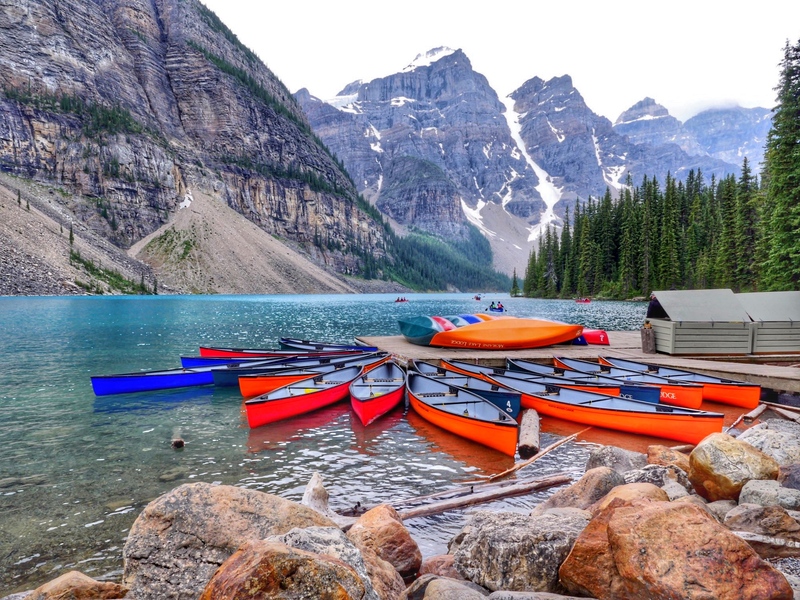 Here are the top things you need to know and one that will really warm your heart. Every time I hear about the newest earth friendly vehicle, I feel a slight pang of guilt that I contribute to the destruction of our environment almost daily. The reality is that certain hybrids just didn’t really seem like a fit for our family. 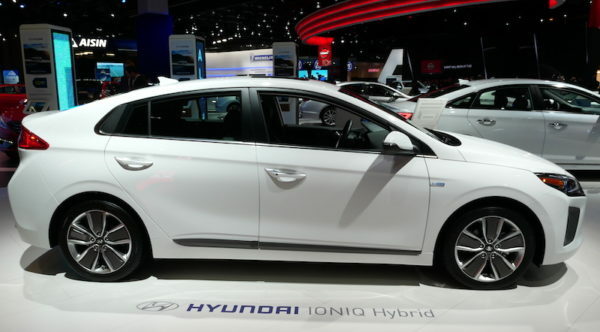 That’s why I was blown away by the Hyundai IONIQ range of vehicles on display at the Detroit Auto Show. Just walking on to the floor, I could tell the cars would be a hit with moms. Although they offer some pretty advance technology, they are still shaped like cars. Pretty good looking ones in fact. In speaking to Hyundai, I learned that they considered a variety of drivers when creating the IONIQ line and thus introduced three different models based on the needs of the consumer; the IONIQ Electric, IONIQ Hybrid, and IONIQ Plug-in Hybrid. While I’m not ready for a fully electric car, I could easily see how the IONIQ Hybrid and particularly the IONIQ Plug-in Hybrid would easily fit into our lives. The IONIQ Hybrid combines a gasoline engine with an 27 kw electric motor. What makes it different from other hybrid models is that it features a dual-clutch transmission making it still fun to drive. The IONIQ Plug-In takes it a step further. It contains a 8.9 kWh Lithium-ion Polymer battery that powers a 45 KW electric motor which means it can travel up to 37 Km or 22 Miles on all-electric emission-free power. A bonus for moms on the go is that the battery recuperates energy as it moves and can be charged through external power supplies which are popping up at grocery stores and malls across the country. What surprised me the most about the Detroit Auto Show is that autonomous driving (where the car drives for you), isn’t that far away. Many manufacturers including Hyundai are testing autonomous models on the road already. It’s an interesting concept for moms that our children may learn to drive in cars that actually have the ability to drive themselves. 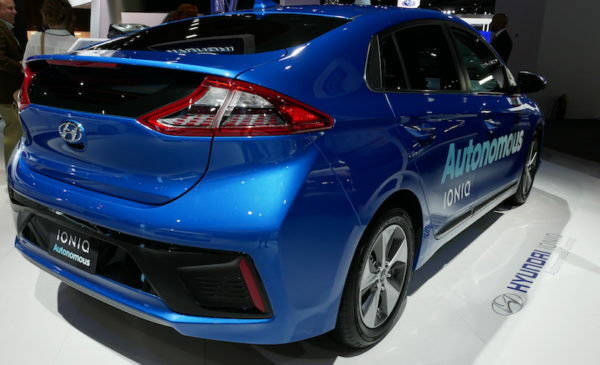 While there were plenty of autonomous vehicles at the show, the most noticeable feature of the autonomous IONIQ featured by Hyundai was what it was missing. Other autonomous models were covered in visible cameras and technology while Hyundai had manage to package it neatly into the existing IONIQ model. 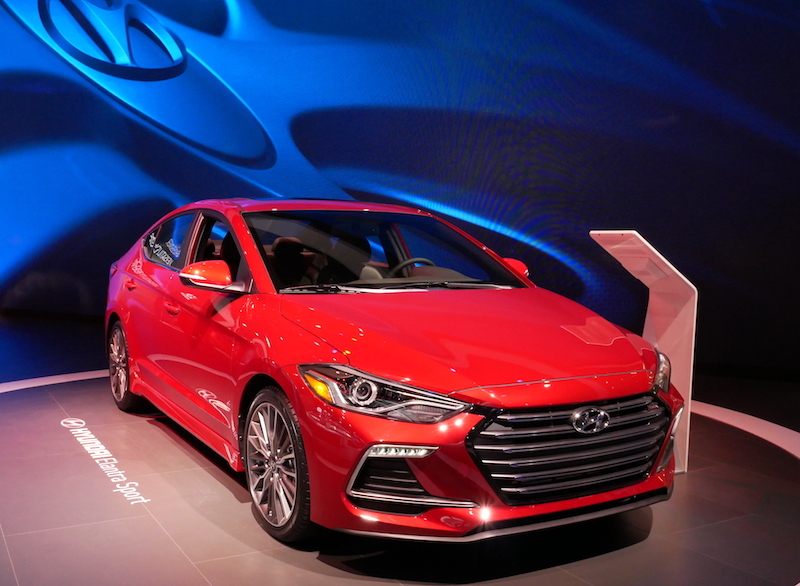 By placing cameras behind the bumper and using cameras that the car was already equipped with like the Lane Keep Assist cameras, Hyundai produced a much more realistic view of what autonomous cars will look like by the time they are available to consumers. The big question is when. While some manufacturers are stating they hope to have a consumer model on the road by 2020 or 2021, in reality moms can expect to finally get to relax in a car closer to 2030. I promised to end this with some heartwarming news and here it is. I absolutely was floored by the commitment Hyundai has made to help end childhood cancer through their Hyundai Hope on Wheels program. Each time a customer purchases an eligible Hyundai vehicle, Hyundai and its dealers make a donation to the Hope on Wheels foundation. So far over $115 Million US dollars has been raised to help fund a way to fight paediatric cancer. As a first timer at the Detroit Auto Show, I was quite surprised by how much I learned about vehicles in such a short time. If you have kids that are into cars or generally are intrigued by what I’ve told you in this post, make sure to check out the Detroit Auto Show before it ends on January 22. Enter to Win Tickets To The Detroit Auto Show!